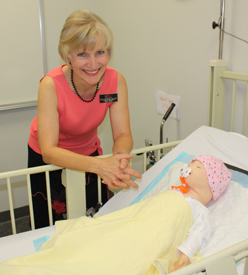 Campus E-Clips: Hospital Names OSU-OKC Nurse Science Professor "Nurse of the Year"
OSU-OKC health sciences associate professor Mary Malaska smiles in one of the campus’ nursing laboratories with an infant simulator. For Mary Malaska, nursing isn’t a job but a way of life. The OSU-Oklahoma City Health Sciences associate professor wanted to be a nurse since childhood. Her commitment and passion to the field is most likely what led to her being named the Nurse of the Year by the Integris Baptist Hospital Maternal/Newborn Child Unit. Malaska has worked at Baptist off and on since 1979. She started out in pediatrics, moved to the pediatric intensive care unit and ended up in the maternal/newborn child unit. She says receiving the Nurse of the Year award is extremely humbling. To be named Nurse of the Year, she was nominated by her peers and manager. When she first heard the news, she thought it was a joke. As part of the award, Malaska’s picture will be on display at the hospital, she will be honored at a reception and she will be invited to serve on the Council of Nursing Excellence. As an OSU-OKC nurse science graduate, Malaska enjoys that the program has continuously been held in high regard in the community throughout the years. For the future, she has big hopes for the program’s growth. When she’s not at OSU-OKC or Baptist, Malaska enjoys spending time with her family: her husband of more than 35 years, three daughters – a nurse, a chemist and a rad tech – and two grandchildren. She also is a seasoned marathoner as she has run a 26.2-mile marathon 14 times. Looking back, she never thought she would qualify to teach but recalls everything falling into place. Malaska began teaching at OSU-OKC in 1996.